Overview: If you want to get paid every time you use your credit card, you are not alone. The USAA Preferred Cash Rewards Visa Signature® does just that with a simple program that puts 1.5% cash back in your pocket for your everyday purchases. 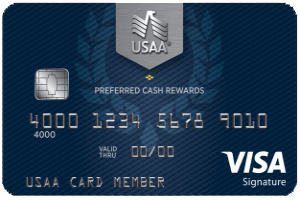 The USAA Preferred Cash Rewards Visa Signature® credit card offers 1.5% cash back on every purchase you make. With no annual fee, this simple cash back rewards card is a winner. If you don’t want to deal with complicated rotating categories or knowing which card to use at which store, this is a great card for you. Earn 1.5% cash back on every purchase with no limit to how much you can earn. Redeem rewards at any time using your smartphone or computer. This card is loaded with purchase and travel benefits. The card charges no foreign transaction fees. It offers auto rental damage and theft insurance for most rental cars. Also, enjoy price protection, extended warranty, travel assistance, travel insurance, luggage insurance, and identity fraud expense reimbursement. Military service members get even better benefits. Enjoy a low 4% APR for up to 12 months during deployment. Finance charges are waived for active military on qualifying campaigns. USAA experts offer financial help before and during deployment to ensure you don’t have any surprises while serving our nation. USAA offers many additional banking benefits to active military members as well. Outside of active military on deployment, this card charges 12.40% to 26.40% variable APR on purchases, balance transfers, and cash advances. There is no penalty APR after a missed payment and no annual fee. Editorial Note: This content is not provided by USAA. Any opinions, analyses, reviews or recommendations expressed in this article are those of the author’s alone, and have not been reviewed, approved or otherwise endorsed by USAA.